This is a list of a diverse group of Art Advocacy supporters and organizations, supporting Public Art, Art Education, Health and Healing, Artists and Community. If you have an item of interest to be considered for this page, email Karen with details. Please put Organization Advocating in the Subject line. Supporting Art Education, Children’s Fine Art Classes (CFAC), a hands-on visual art experience for Louisville’s youth that is an after school program hosted at K-12 schools and youth centers. The program meets weekly for two hours, giving students ample time for in-depth art-making, for ten weeks in the fall and spring. CFAC provides intensive, in-depth studio art experiences for talented and motivated students, grades 4-12, and elementary and middle school students are offered concentrated studies in drawing, painting, mixed media, art history, critique, and aesthetics. CFAC students “graduate” with the ability to discuss their work and their peer’s works intellectually and emotionally. Supporting Health & Healing, Young Audiences of Houston is a program that has partnered with local children's hospitals and specialized treatment centers for over 20 years, providing free programming for children undergoing treatment as many hospitalized children are required to be out of school for extended periods of time. The goal of Young Audiences of Houston’s Healing Arts programming is to use the tremendous power of the arts to spread joy, give hope, manage pain, support treatment, and leave positive memories for hospitalized children and their caregivers. Young Audiences Healing Arts programs also serve homeless youth facing challenges and tackling issues, the arts become a valuable tool for creation, discovery, expression, hope and healing. Supporting Art Education, Creative Connections, a before-after school program offered at REACH Studio Art Center for Lansing area youth ages 6-12. The school district provides buses for the students to get from REACH to 3-6 targeted schools each 16-week semester for their delayed start on Wednesday mornings. Lansing School District students enroll free of charge in the program. Up to 100 students will have the opportunity to enroll in one term or semester of the program, where they will engage with local artists on integrated art learning through special projects that build on the previous week’s lessons and projects. Each term of the program covers a different, engaging theme which is planned and run by an artist/teacher and will involve guest artists, college students, volunteer mentors, and partnerships with other local organizations. Goals include building the student's confidence, and art experiences to improve decision-making and problem solving skills, indicated by their ability to complete art projects and participate in program activities. Supporting Artists, Pro Arts Jersey City is a professional membership community and volunteer organization made up of a working board of professional artists and a general membership of around one hundred. Started in 1994 with a call to the artists of Hudson County, Pro Arts is dedicated to working together toward the promotion and advancement of the visual arts and the advancement of the rights, welfare and economic well-being of professional artists. Pro Arts' members are artists who are actively engaged in the visual arts as a career. They seek to incorporate the arts into the fabric of city life with programs that stimulate, entertain and educate the general public and encourage artistic excellence. Pro Arts is an active partner with many organizations, including museums, neighborhood associations, preservation societies and artist groups, as well as the business and civic communities of Jersey City. Supporting Health & Healing through Art, at The Baptist Medical Center in Jacksonville Florida, The AgeWell Center for Senior Health's ENRICH (Empower, Nurture, Reminisce, Inspire, Collaborate, Hope) Cognitive Program was created in 2017, to improve the overall quality of health for patients experiencing moderate to moderately severe cognitive impairment and their care partners, through the use of art, music, reminiscence, yoga/movement and sensory integration. The year-long pilot program served twenty patient/care partner couples. The goal of the ENRICH Cognitive Program Pilot was to provide an avenue of support for our patients and their care partners. Results from both a physical survey and from in-program observation established that the pilot successfully achieved that goal. The plan for ENRICH going forward is to offer a 6-week cognitive enhancement program divided into 3-week segments with a brief break between segments. It is designed to provide the care partner with a brief respite along with education and strategies for both self-care and caring for their loved one. Each 3-week session can accommodate ten patient/care partner couples, potentially serving forty to fifty couples within a year. One component of the program are the Art projects associated with daily life skills and activities with the overall goal to provide sensory stimulation and a sense of being productive, which improves happiness, life satisfaction and self-esteem. Arts in Health is a field that incorporates multidisciplinary use of the arts in healthcare and community settings to benefit all members in a community by enhancing their health and well-being. Supporting Public Art, Humanity in Art believes that art is the language of humanity and a medium of expression which allows for the communication of the intricate and complex emotions which make us inherently human. Through public art the greater human collective can be engaged, environments can be infused with beauty, and centerpieces can be created for community. One of their 2018 mural projects is in downtown Nanaimo, at an abandoned building spanning an entire city block http://www.humanityinart.com/in-community-1.html. Once a cultural hub and pride of Vancouver Island, parts of downtown Nanaimo has struggled with a growing population of homelessness and an area hit especially hard by the ongoing opioid crisis. Right in the middle of downtown is an abandoned building spanning an entire city block. The goal and hopes of Humanity in Art’s project here is to attract positive foot traffic, deter vandalism and reclaim this prominent space by installing Nanaimo's first free art wall and encourage its use for all spray artists in our community – plus be a source of positive community building to show our community how urban art can benefit and heal areas that need the most love. To preserve the project, Humanity in Art hopes to have the murals coated with an anti-graffiti sealant, and the parameter of the building be maintained throughout the year. Supporting Public Art & Art Education, the students of Martin County High School have collaborated to design and paint a large mural in a space donated by a local business in the heart of downtown Stuart, FL. It is a large wall measuring 70 feet long by 12 feet high and hopes to be a major attraction for the downtown area and a source of pride for the art students at Martin County High School. The project would promote and foster relationships between school stakeholders and local community, connect students to experts in the field, and allows for student growth in painting and design through real-world experience. The students, with assistance from local artist and trained art educators, will successfully paint a mural that encapsulates the history of Martin County Florida. The primary beneficiaries would be local business owners, residents of Martin County, and the overall community at large. The Florida Department of Education has posted about this project in their DOE Arts Newsletter and requested to be kept informed about the progress of The Historical Mural Project. Supporting Art Education by increasing visual art education opportunities for students and support programs, The IHSAE is a statewide project that utilizes monumental art exhibitions, and a uniquely growing network of teachers, organizations, and post-secondary institutions as a vehicle to connect students and teachers with widespread opportunities for advancement and creation while exposing the beauty and technical mastery in their work. IHSAE advocates for young people and reinforce the power of art in their lives. Since 2014, the IHSAE has been responsible for awarding high school art students more than $50,000 in cash and prizes, facilitating over 200 early college program scholarships, and connecting over 800 high school seniors to tuition scholarship offers totaling more than $60 million. Each year the IHSAE continues to grow and improve its ability to connect participating city, suburban, public and private high school students to future post-secondary opportunities in the visual arts. What began as a monumental exhibition to support and acknowledge student achievements in the arts has grown to impact all aspects of art education across Illinois and beyond. The IHSAE is a multi-pronged approach to art education advocacy that has systemic impacts. Supporting Art Education for K-5 students, Hawaii Artist Collaboration organizes an annual parent-teacher shopping spree at their local Walmart. Six parent teacher teams compete with each other within Walmart for 15 minutes to shop for art supplies for their elementary school. All teams get to keep all of the supplies that they gather within their allotted dollar value and the team that comes closest is declared the winning team garnering a grand prize of more art supplies for their school. This program brings teachers and parents together before the start of the new school year for desperately needed art supplies that can be used in the teacher’s classrooms for regular art or special art projects throughout the academic year. Two elementary schools are currently participating. Hawaii Artist Collaboration would like see future development expand an event to every Walmart in Hawaii. The model for this program can be duplicated in any city in the nation and it was designed that way on purpose. Supporting Art Education, CultureWorks provides students, Grades 6-12, with access to high quality art and design education under the guidance of teaching artists and alongside nurturing adult mentors. They offer a pay-what-you-can-afford system and target at-risk youth who are artistically inclined but under-resourced. CultureWorks provides instruction in traditional visual arts media and seeks to build relationships between students and future employers (with classes and field trips at local art and design studios), to help them visualize themselves in a creative career, and to encourage their personal growth as individuals and artists. Supporting Public Art, The Artist SEVEN is a muralist and the Creative Director of the Burnin' Bridges Street Art Project, an ongoing art project started 3 years ago in Chattanooga, Tennessee that involves the implementation and installation of large scale street art murals around the city of Chattanooga, generally located in different communities throughout the city. The objectives of the program are creating community awareness, beautifying blighted areas and helping to develop a sense of pride in the community through art, breathing life into neglected parts of town through art, reshaping the local artist culture and creative landscape, and inspiring the up and coming developing community of artists in the Chattanooga area. Supporting Health & Healing through Art, one girl named Erin earned her Girl Scout Gold Award by coming up with a way to help families in her community by creating Project ArtBox, an idea to build an art 'library' and have an actual ArtBox containing supplies to benefit children and their families being treated at the Children's Hospital of Wisconsin, many of them staying at the Ronald McDonald House. Erin’s goal was that experiencing art would be a creative release for the children and families to de-stress during a very time of their lives. Supporting Health & Healing through Art, The Kids & Art Foundation is a nonprofit organization that provides Arts workshops to children with cancer and their care circles to improve their well-being during treatment, as survivors, and in bereavement. They team up professional artists with families facing pediatric cancer for free art workshops at treatment centers and unique destinations for creativity. Together they use art as healing to empower, encourage, and create memorable experiences. Studies show arts and creative expression improve the well-being of cancer patients and their care circles. 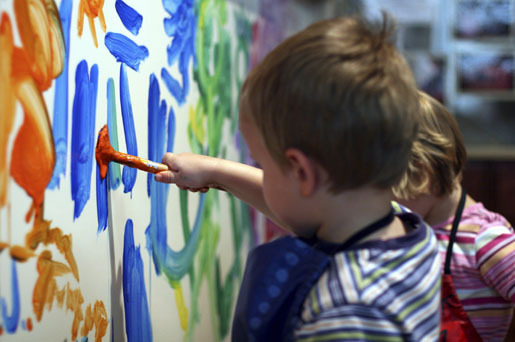 Research with children with cancer indicates that engaging in drawing and painting is an effective method for dealing with pain and other disturbing symptoms of illness and treatment. The Kids & Art Foundation was founded in 2008 by Purvi Shah, a parent whose child was diagnosed with cancer at age three, then lost his life six years later. Her inspiration came after seeing the healing impact moments of art and creativity had on all the members of her family while her son was in treatment for cancer. Supporting Art Education since 1971, the Doña Ana Arts Council is a non-profit organization created to enhance the quality of life in Las Cruces and Southern New Mexico by ensuring that the performing, visual, and literary arts are an integral part of education, economic growth, and community development. By staging memorable events, producing innovative programs, supporting emerging artists, and leading the arts community with effective advocacy, the Arts Council continues to broaden the vision of the arts in the greater Mesilla Valley. Through the arts, they enhance the quality of life and develop the cultural, educational, and economic growth of our community. Supporting Artists, Art Organizations, Arts Education and Arts in the Community, Allied Arts of Whatcom County is dedicated to the arts in their region by empowering local artists through organized festivals and events, enriching our local school children through educational outreach programs, and working as a liaison to art enthusiasts of all ages, within our uniquely creative community. For almost 40 years, they have been a leader in fostering and supporting the local arts scene and serves more than 50,000 people annually. Supporrting Art Education and Health & Healing, Genesee Lake School is a nationally recognized school dedicated to improving the lives of children, adolescents, and young adults with developmental disabilities, mental health disorders, neurological disorders, and emotional disturbances. We follow an individualized, person-centered, and integrated team approach, emphasizing positive behavioral support, therapeutic relationships, and developmentally appropriate practices. Their art education program uses a therapeutic approach to art making for students, hoping to teach students art at an independent level, boosting their self esteem and building a positive self image. The school strives to accomplish this in the art room with appropriately adapted equipment. Supporting Public Art and Art Education, Spare Parts art educators hope to facilitate art making classes in an underprivileged neighborhood of San Antonio. These youth will ultimately show their artwork in Art//Craft, San Antonio's first mobile gallery made from a shipping container. The public will be invited to see the exhibition for two days. Student artwork rarely gets to see the space of a professional gallery space and Spare Parts is dedicated to supporting advocacy of art education through environmental accountability by ensuring creative materials and supplies are green. Spare Parts will reserve Art//Craft and place it in this same neighborhood where folks don't have at-hand access to galleries or museums. The student-created exhibition will be open two days with free admission and art making for all ages. The goal is to give underprivileged children of San Antonio's inner city the once-in-a-lifetime opportunity to see their work on the walls of a professional gallery while making this unique experience accessible to the community from where it comes. We are bringing the fine art experience to a neighborhood where it is hardly accessible. Art//Craft is a nationally-recognized gallery and unprecedented place-making model. After the exhibition, students have the option to keep their work or install it in a public location to be determined by the participants. Supporting Public Art, the Compassion Fresco is an 1,800 square foot public Buon Fresco Mural project to be painted on a historical brick building and scheduled to start in late September 2019. This is an important project that is helping to preserve the ancient medium of buon fresco. Although the Frescoe's content is important and relevant, its aim is to bring attention and awareness of this great art form to a large public audience and help preserve the medium for future generations, and to create something permanent and beautiful that opens a continuous dialog on the advantages of living an authentic, compassionate existence within our communities and our world. The Compassion Fresco is an international collaborative project involving female fresco artists from Italy, France, the USA and the UK, and has sponsorship from The New York Foundation for the Arts.